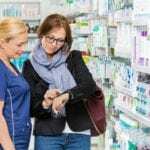 Pharmacy technicians work under the supervision of a pharmacist to provide customer service, dispense medications, and manage the administrative functions within the pharmacy setting. They perform routines tasks related to the filling prescription orders and educating patients on the use of prescription medications, receiving orders over the phone, and maintaining a clean and safe environment. Other duties include maintaining patient records, preparing insurance claims, labeling products, preparing IVs, transcribing physicians’ orders, counting pills, and measuring, packaging, and delivering medications. Technicians spend a great deal of the shift on their feet so prospective technicians must be comfortable standing on their feet. Heavy lifting and retrieving products located on high shelves will also require good physical and mental health. The pharmacy technician program prepares students for registration with the California State Board of Pharmacy, which is a legal requirement in the state. Those who have prior criminal convictions related to pharmaceutical practice will be denied registration by the Board. CSUSB prepares adult students for the Pharmacy Technician Certification Board Exam and helps them develop the foundational knowledge and skills to enter the pharmaceutical industry. The program is designed to be completed online and includes an externship for students to gain real-world experience. During the externship, students will dispense medication and participate in the daily operational activities at a Walgreens or CVS pharmacy. Upon completion of the program, students will receive a Certificate and will be prepared for success on the PTCB exam. The curriculum offers 600 hours of instruction, including the 200-hour clinical externship. Course topics include working at a pharmacy, medical word building, business of pharmacy, simulation preparation, basic anatomy, computer fundamentals, non-sterile compounding, institutional pharmacy, medication safety, community pharmacy, prescription, and pharmaceutical calculations. Tuition costs $2,995. A payment plan is available. San Bernardino Valley College facilitates a pharmacy technician program that concludes with a Pharmacy Technician Certificate. Students may also earn an Associate of Science Degree in Pharmacy Technology. The program prepares students for entry-level employment as a pharmacy technician where they will assist pharmacists with the provision of medication and other healthcare products to patients. The certificate program requires completion of 21 to 33 credits. Students may complete an additional 30 units to earn the associate of science degree. The certificate program covers a total of 618 hours including 240 hours for the pharmacy clinical experience. Course topics include preparation for college writing, elementary algebra, pharmacy systems, pharmacology, pharmacy calculations, human anatomy and physiology, and pharmacy seminar. A background check may be required for participation in the clinical experience. A physical, TB test English fluency, writing, math, and speech are other requirements for admission. Tuition costs $2,400. Financial aid is available. The pharmacy technician program at Mission Career College prepares students to perform routine tasks in a pharmacy setting. The program offers 52-semester credits in 36 weeks. The curriculum comprises of 720 hours of theory and practical learning experiences in pharmacology, pharmacy calculations, pharmacy operations, pharmacy law and ethics, measuring, weighing, and pouring medications, inventory control, pharmacy medical terminology, reading and interpreting prescriptions, and drugs and their effects on the body. Students will also have the option to complete a clinical experience at a local healthcare provider. Graduates are prepared for success on the PTCB. Tuition costs $8,600. The occupational pharmacy technician program at Chaffey College prepares students for work as a pharmacy technician. The curriculum includes theory and practical experiences to help students function as a pharmacy technician upon licensure. Practical experiences take place in simulated and supervised clinical environments. Course topics include pharmacology of the body systems, principles of community pharmacy practice, sterile products, principles of institutional pharmacy practice, pharmaceutical calculations, community pharmacy operations, institutional pharmacy operations, over-the-counter products, and a clinical externship. Tuition costs $1,281. Books and supplies cost an additional $1,055. The Pharmacy Technician program at the American College of Healthcare covers the essential topics that will prepare students for work under the supervision of a pharmacist. The curriculum covers 970 hours lectures and practical instruction in 36 weeks. Students earn 48 credits at the conclusion of the program. Course topics include communication, professional development, pharmacy law and regulations, pharmacology and the nervous system, antibiotics antifungal antivirals and asepsis, OTC brand and generic and motor systems, pharmacology and the vascular integumentary systems, vitamins, minerals, and alternative medicals. The externship is an important part of the program as it gives students the opportunity to interact with other professionals and patients in a variety of healthcare setting. Classes meet Monday through Thursday from 8:00 am to 1:00 pm. Tuition costs $15,645 and includes books, uniforms, CPR course, certificate and license fees, and program specific equipment. 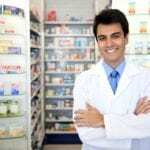 The pharmacy technician program at the University of California prepares adults to work under the supervision of a pharmacist to perform pharmacy-related duties. The curriculum provides a foundation for those who want to become a pharmacist. Graduates are prepared for success on the PTCB exam. Contact the school for more information on scheduling and cost.